Salon's. Everywhere I go, they always happen to catch my eye. If I happen to drive by & spot a cute Salon....I must take a picture or get an idea for our Salon in Stayton.... ACT I Hair Design. 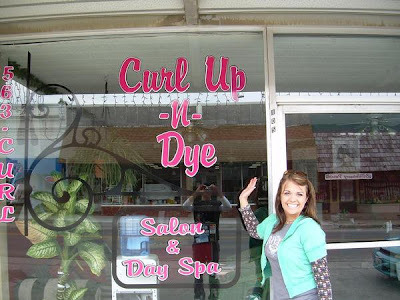 This Salon is located in the little town of Nob Noster, Missouri. And the Salon...you can see is called, Curl Up -N- Dye. Cute cute! So I had to pretend to be Vanna White and display this tickle my fancy Salon and snap a quick pic! She did a wonderful job! We have this logo on our brochures, my business cards and @ the front door & back door. We have a new sign hanging in the front room that my friend Denise Bunn (Take Our Words For It/ Vinyl signs co.) made as a Gift for the Salon It say's, Be Yourself...Everyone Else is taken. Everyone just adores it when they come visit. And I love that they do. I think I take in something new and remove something old, and move something here and organize something everyday. But I guess that's the fun part of it all. Daughter to the World's best MOM & DAD, Sister to the Coolest sister (Stacy) and brother (Casey) (Taylor) a GiRL could have, Auntie to the cutest kids (Connor)(Caleb)(Kenzi) I've ever seen, Friend to the most beloved and fun-having group & a wife to the MOST kind gentleman/eyecandy a Girl could wish for! I love My Family! Hope Everyone has a Safe & Hapy Holiday Season! HO Ho HO!